In late April 1945, the remaining prisoners were removed from Stutthof by sea, since Stutthof was completely encircled by Soviet forces. Again, hundreds of prisoners were forced into the sea and shot. Over 4,000 were sent by small boat to Germany, some to the Neuengamme concentration camp near Hamburg, and some to camps along the Baltic coast. Many drowned along the way. Shortly before the German surrender, some prisoners were transferred to Malmo, Sweden, and released to the care of that neutral country. It has been estimated that over 25,000 prisoners, one in two, died during the evacuation from Stutthof and its subcamps. Soviet forces liberated Stutthof on May 9, 1945, and liberated about 100 prisoners who had managed to hide during the final evacuation of the camp. The evacuation of prisoners from the Stutthof camp system in northern Poland began in January 1945. When the final evacuation began, there were nearly 50,000 prisoners, the majority of them Jews, in the Stutthof camp system. About 5,000 prisoners from Stutthof subcamps were marched to the Baltic Sea coast, forced into the water, and machine gunned. The rest of the prisoners were marched in the direction of Lauenburg in eastern Germany. They were cut off by advancing Soviet forces. 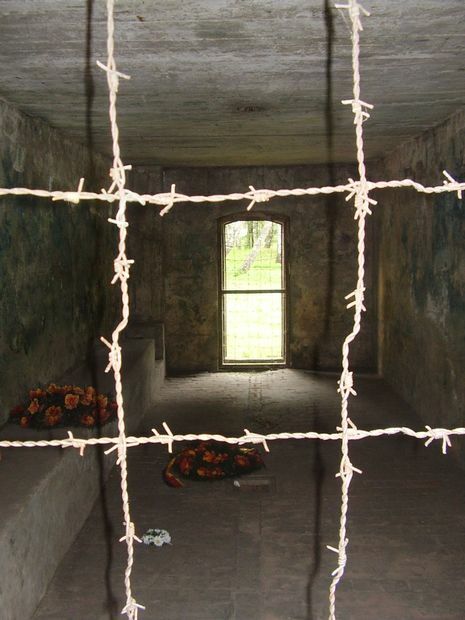 The Germans forced the surviving prisoners back to Stutthof. Marching in severe winter conditions and treated brutally by SS guards, thousands died during the march. In late April 1945, the remaining prisoners were removed from Stutthof by sea, since Stutthof was completely encircled by Soviet forces. Again, hundreds of prisoners were forced into the sea and shot. Over 4,000 were sent by small boat to Germany, some to the Neuengamme concentration camp near Hamburg, and some to camps along the Baltic coast. Many drowned along the way. A barge full of prisoners was washed ashore at Klintholm Havn in Denmark where 351 of the 370 on board were saved on 5 May 1945. Shortly before the German surrender, some prisoners were transferred to Malmö, Sweden, and released to the care of that neutral country. It has been estimated that over 25,000 prisoners, one in two, died during the evacuation from Stutthof and its subcamps.